ISBNs, Barcodes, and Scam Sites, Oh My! – Tell Your Story. Get Noticed. ISBNs, Barcodes, and Scam Sites, Oh My! ISBNs. Barcodes. Unless we plan on selling our books only at private venues, or simply giving them away free, we know we need these little bits of business mumbo-jumbo affixed to the lower corner of our back covers. ISBNs and barcodes aren’t a simple nice-to-have. They are a precursor to legitimacy in the marketplace. They are required to sell online, in bookstores, and at any venue that takes digital payments. They’re also a bit of a mystery wrapped in an enigma of legalese. If you’re publishing through a house, chances are they’ll take care of this bit of legalese for you. What is an ISBN and why do I need it? ISBN stands for International Standard Book Number. It’s the 13-digit number (formerly 10 digits) displayed on the copyright page and affixed to the back cover of a book that uniquely identifies and legally recognizes an edition of a publication. All ISBNs are internationally recognized and registered across 170 countries. Your book needs an ISBN if you plan to sell it, market it, or otherwise promote it through any sales channels outside yourself. The number provides identification for your book that is both human and machine readable. What is a barcode and do I really need that, too? Barcodes are machine-readable representations of ISBNs. They follow a specific format for numeric representation that computers and inventory systems understand. Any edition of your book that you intend to sell in hard-copy format (hardbound, paperback, etc.) should have a barcode generated for the edition’s ISBN. There are tools and applications online that generate barcodes from your ISBNs. At the end of the day, your barcode is just an image that follows a standard format. You can pay to have it generated, you can purchase software that generates barcodes, or you can use a free tool online to create the image yourself. If you choose to self-generate your barcodes, have them tested and verified by a trusted retailer prior to printing your book! Here, let me google that for you. Forty-six million results! Look at all those options! How will you ever figure out where to go? Who has the best deal? It’s rather simple: Only one of those sites is legitimate, it’s not any of the top three, and there is zero price variance when purchasing an authentic ISBN. If you are working with a publisher who is securing your ISBN for you, you can be sure they are going through Bowker Identifier Services. At least you should make sure they’re going through Bowker! You can also be sure they’ll either bake the cost of your ISBN into your publishing price, or they’ll take royalties to recoup the cost. (4) properly associated with a barcode, if you purchase your barcode from Bowker along with the associated ISBN. To obtain ISBNs and barcodes through Bowker, create an ID on their site, and then make your selecction. Once you purchase your ISBNs, you will be able to register them to your title and release format online. Amazon says they’ll supply me with an identifier for my eBook. Isn’t that good enough? That depends. If you’re using Kindle Direct Publishing, Amazon supplies you with an ASIN, which is unique to Amazon. The Amazon identifier might feel an awful lot like an ISBN, but it’s not the same. In other words, you can’t use an Amazon-supplied ASIN to sell your eBook outside of Amazon’s platform. However, you absolutely can sell within Amazon’s platform (and anywhere else you can get traction) with an ISBN. The ASIN is “free” from Amazon, but you pay for it in terms of lack of flexibility. Your best bet is to secure your own ISBN and use it when publishing through Amazon. 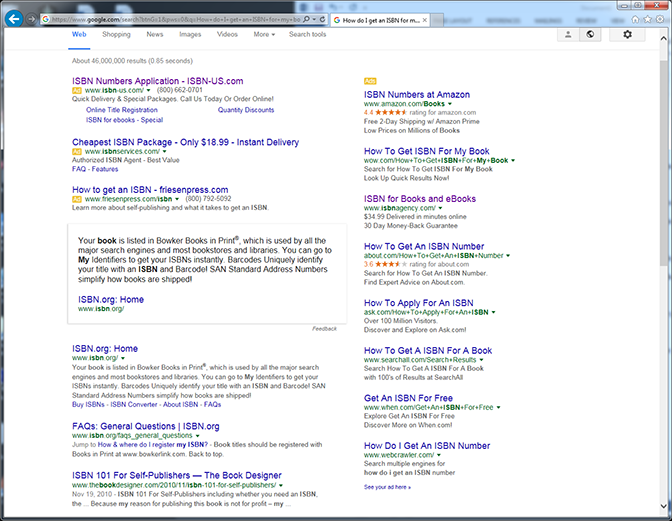 How many ISBNs will I need, and how much do they cost? You will need to have one ISBN for every edition of your book: Hardback, soft cover, mass-market paperback, EPUB, MOBI and PDF versions each require a unique, 13-digit ISBN. Fortunately, Bowker sells 10 ISBNs for a steeply discounted price. A single ISBN is $125. However, a block of 10 ISBNs is $250. Regardless of when and where you use your ISBNs, you will always own them. Bowker sells generated barcodes for any ISBN you own at any time, and you can save unused ISBNs in your purchased block for future publications. I encourage anyone reading this to do further research. The following sites provide a wealth of technical, legal and historical information regarding ISBN numbers and barcodes. Study up, grab your ISBNs, get out there, and publish that book! Need publishing help? See our services or contact us for assistance.